Preparation: Bring a cross to hold up so that the children can look up to it. How many of you can remember a time when you felt very sick? (Children can raise their hands or respond.) Have you ever felt so sick and weak that you couldn’t get out of bed? Or so sick that you could hardly move at all? When Moses was in the desert with the Israelites, there was a time when lots of people got bitten by snakes and became very sick. They were so sick they couldn’t move, and they almost died. God told Moses to make a statue of a snake mounted on a tall pole and to show it to the sick people. The people needed only to look up at that snake and they would get better right away. This morning, I’d like for us to try something. We’re going to pretend that we’re so weak and sick that we can’t get up. You can lie down if you want to or just sit right where you are. Just make sure that you can still see me from where you are. We’ll pretend that we’re so sick that we can’t move our toes, our feet, or our legs. We are so weak we can’t move our hips, and our stomach muscles don’t work anymore. It’s getting worse now, because we can’t move our fingers, our hands, or our arms. I’m not going to be as sick as all of you, because I have to keep talking; but I want you to pretend that you are so sick now, that you can’t even move your head. Keep your eyes open, though, because I want you to look at me. Even though you can’t move your body or your head, you can still look at me, can’t you? You can look up. (Hold a cross up so everyone can see it.) Can everyone see this cross? All you have to move is your eyes, and you can see the cross. When we sin and do things we know we should not, it is like being sick. We’re sick in our hearts, and we need to be made better. 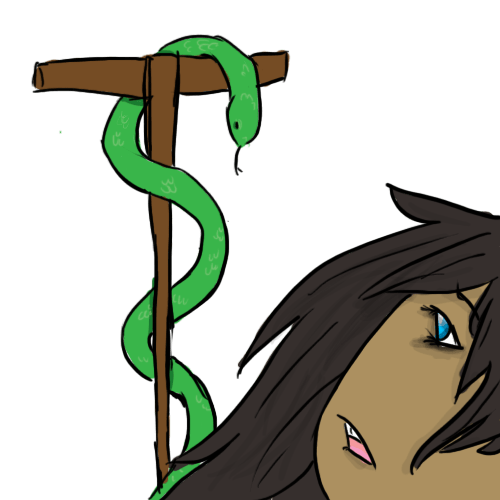 When Jesus died on the cross, he was raised up like that snake on a pole that Moses made. And, like the Israelites in the desert, everyone who looks up to Jesus on the cross and believes in him, will not die. They will be saved and have eternal life. Do we have to jump up high or climb up to God in heaven for God to save us? No. We are not saved by anything we can do. As Ephesians 2:8 says, “by grace you have been saved through faith… it is the gift of God” (NIV). Jesus saved us when he died on the cross. We only have to look up to him and believe in him. Do you know the Bible verse, John 3:16? Let’s say it together: “For God so loved the world that he gave his only Son, that whoever believes in him should not perish, but have eternal life” (RSV). Prayer: Jesus, we cannot be saved or even come to believe in you by any effort of our own. We look to you to save us from sin and to bring us everlasting life.